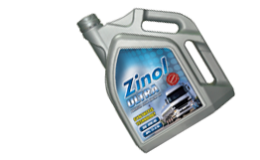 ZINOL ULTRA DIESEL ENGINE OIL is a high performance diesel engine oil specially designed for use in high speed turbocharged diesel engines running on extremely low sulphur diesel as well as conventional high sulphur diesel fuel. Its advanced additive system ensure excellent control over soot induced wear, high temperature piston deposits, corrosion, foaming and oxidation. Latest heavy-duty diesel vehicles not employing diesel particulate filters operating in very low ambient temperatures. SAE 15W-30 is also suitable for engines employing Exhaust Gas Recirculation. All turbocharged and naturally aspirated diesel engines used in on-road applications, mining, construction and other off highway applications. All automotive diesel engines and off-highway vehicles. Excellent performance with extended oil drain intervals on low emission engines. Excellent soot dispersancy , reduced soot induced oil thickening and associated engine wear. Outstanding thermal stability and oxidation resistance to maintain excellent engine cleanliness. Multipurpose oil for old & new engines.